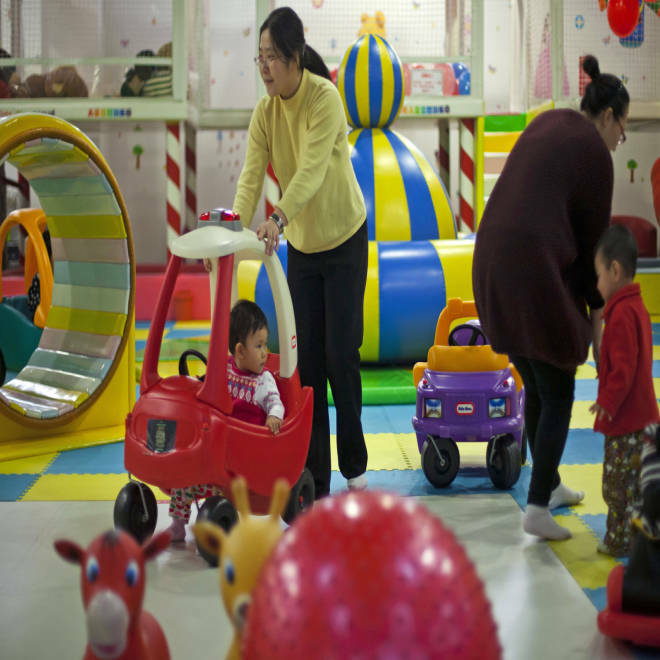 Parents play with their children at a kid's play area in a shopping mall in Beijing on Jan. 10. BEIJING — China has quelled speculation its controversial "one-child" policy is to be scrapped, instead announcing Wednesday that family planning laws to curb the birth rate will remain. "The policy should be a long-term one and its primary goal is to keep a low birthrate," Wang Xia, minister in charge of the National Population and Family Planning Commission, said. The pronouncement comes after months of speculation that the decades-old restriction would be abandoned. In October, a Chinese government think tank urged the policy be relaxed to allow two children for every family in the country by 2015. "I’m surprised," said Professor Shaun Breslin, associate fellow at U.K. think tank, Chatham House. "Almost everything we had heard in recent months pointed towards a relaxation of one-child." The 1979 law prohibits about one-third of China’s 1.3 billion citizens from having a second child. The policy is officially backed up by fines, but campaigners say more than one million forced abortions are carried out every year. It has slowed the spectacular growth of the country’s population, preventing an estimated 400 million births over three decades. In a related statement on Wednesday, the family planning commission said China’s current low birthrate "is not stable because, with the exception of some developed cities, the fertility level in most of China's regions will rise if the basic state policy of family planning is abolished." "Therefore it is necessary to stick to the basic state policy of family planning to stabilize the current low fertility level," it added. Breslin said China’s looming demographic crisis — a huge elderly population supported by a relatively tiny younger generation — highlighted social problems such as the need for greater universal healthcare. "For most Chinese people the current system works fine if you have a sore throat, but a knee operation could use up all your savings," he said. "That means many are keen to ensure they have a male child in order to ensure there is enough income in the family." He added that Wednesday’s announcement did not mean China’s new leadership was eschewing economic or social reforms. "It can take a year or two for any new leadership in China to introduce change," he said. Professor Hu Xingdou, of the Beijing Institute of Technology, told the South China Morning Post it would be difficult for the government to abolish the one-child policy overnight. "China still needs a family-planning policy due to our vast population and lack of cropland, as well as the relative deficiency of per capita resources,” he said. The one-child rule is mainly enforced in urban areas. Wang also announced an expansion of rural healthcare provision for pregnant women, and said efforts "should also be made to rectify the imbalance in gender ratio." She also said a "complete working system" would be established to "in light of the great numbers of young migrant workers flocking to the cities for jobs."